Why Do We Go To Church, Daddy? Deacon: So what did you tell him? Usher: I told him it was his problem. After all, he’s fallen for it all his life, and now he’s at the point of no return. No matter what he tells his kid, his kid will see him as a hypocrite because he still goes and doesn’t feel he can change as it’s too late in life and after all, the fellowship hour has really good desserts! Deacon: Usher, you’re so so lame! Usher: Deak, I been told that the church is supposed to be separated from state and I don’t have a problem with that. But how come all them humans run the church like a business? Usher: So that’s why the pastor is the CEO, the assistant is the aggressive VP with the pedigree pursuing the career path and the sheep are mere afterthoughts? Deacon: You go it! They simply see church as a vocation and nothing more. Once they find a place where they can attain control, they must build up their congregation so they can store away their retirements and 401Ks and all that crap. The sheep are the ones who fund it all, but nothing more. Usher: So where is God in all this? Don’t they know that the “command and conquer” model is subject to strife, infighting and easily overthrown or divided? Deacon: That doesn’t really matter to them. In fact, it plays right into their hand. It’s because they are in it mostly for the money. (If you took away their money, they’d leave.) When things get rough, they simply pacify the sheep with programs (crumbs) and they use the sheep money to fund it all. Kind of interesting, eh? In the days of the Apache, the government couldn’t tame the Apache because they were decentralized. Killing them was actually making them multiply. They had no chiefs and no hierarchy, they operated in circles of influence. Destroy one circle, and two more would crop up. They were a nemesis even into the 20th century after most of the other tribes had been conquered. Usher: How did the government finally conquer them? Deacon: Funny you should ask. They gave the spiritual leaders (who operated just like al qaeda cell group leaders), the Nant’ans – cattle. With this brought prestige and a pecking order and voila! In just a few years, the Apaches were tamed and living out their lives in reservations with cows and booze! Usher: Kind of like dumb Christians going to church every Sunday and doing just what the pastor wants in exchange for babysitting, donuts and coffee? And all at the expense of the sheep? Deacon: Most people would say your depiction is a little harsh, but you get the picture…. Usher: Wow, don’t the sheep know that if they simply stop going, all of the corruption will stop? They don’t need these greedy blokes to pacify them and lull them into a false sense of security. And if they sat and did the math and realized that all that “tithe” is just funding the 401K and paying for the home of some money-grubbing pastor, why won’t they walk away? Deacon: The oldest and largest companies in the world are insurance companies. They sell peace-of-mind and nothing more. Sheep are dumb and they will pay anything for someone to tell them everything is “gonna be all right”. Usher: Deak, are Western Christians just more “stupid” than the average human? Deacon: To what are you referring to now? Usher: Their “church planting” practices. They simply just don’t get it. Usher: Well, they take the idea of “franchising”, they call it “church planting” and then they forget about the most important parts! Deacon: What do you mean? Usher: Well, they simply go half way. They hire these young dudes fresh out of the seminary, make ’em assistants and youth pastors and then they just leave them up to their own devices! Then they end up with 35,000 denominations and a watered-down brand. They never close the deal! Deacon: What should they do? Usher: Everyone knows that the key to succes is franchising. Recruit the franchisee (pastors) into a long term commitment, make them swear their allegiance to to the mother ship and then use every legal vehicle and disclosure document to either confuse them, trap them or keep them silent. Add to this a proprietary system (sole source providers [denomination], proprietary software [doctrine/brand/protocol], indigent service folk [board], micro-managing regional watchdogs [management/Vatican], lazy in-house counsel [lawyers], super PR department [press control/propaganda], senator on the hill [political insurance]) and you’re on your way to absolute prosperity. Deacon: Usher, you’ve described nothing more than a feudal system of control, deceit and sleight-of-hand! Usher: Exactly! They simply need to all get on the same page and build the brand! They can call it Jesusbucks! If they’d just trade in the denomination for a universal brand, they’d be recognized around the world! There’d be no confusion. Everyone would make money! A Jesusbucks on every corner! Has a nice ring, don’t you think? Deacon: Usher, you’ve gone off the top branch! “Sir, how would you like your religion? Protestant blend? Light on the conscience? Lukewarm? and would you like some non-convicting rationalization with that? Please make yourself comfortable in our worship center while we fix you right up! “Next please” – Non-denominational blend? Extra heavy on the condemnation? Hell fire hot and NO GRACE! Sir, your order will be right up. Have a seat against the elder’s wall and we’ll be right with you. “Can I help the next Christian in line?” Catholic blend? on ice? Mass rush and hold the pergatory (that will require a 15% gratuity, sir)! Coming right up sir, please step to the front of the line! We like tippers! Usher: Hey Deak, I think I’ve got the perfect out for pastors! Deack: Why do pastors need an out? Usher: Because they all use different biblical excuses to back their choices, cover up their real motives and snow the church goers. They need to be just like the CEOs of our great capitalistic country and tell everyone the same thing in response to any decision that the congregation might disagree with. Layperson: Pastor, how come you built a bigger building and more classrooms instead of giving more money to the mission field? Layperson: Pastor, I understand you’re stopping the homeless ministry in light of increasing the choir budget and adding a new addition onto the chapel. Pastor: We really don’t have the resources to help the homeless. There are much more qualified services that are offered by the state. It’s really not our calling. We are not the answer to today’s social demise, after all, “we’re only a church”. Layperson: Pastor, can we sponsor the orphanage infrastructure project so they can have clean drinking water and a working septic system? If we forego the mission trip ($1500/kid x 30 kids) and simply give the money directly to the orphanage, they can hire local companies to do the work that has been needed for 5 years. Pastor: We’ve already committed to the mission trip. I’m afraid this type of change would be too disruptive to the plans everyone has made for the trip. Maybe next year. After all, we can’t fix the world, “we’re only one church”. Dissention – Good or Bad? Deacon: Yeah, share it with me…. Usher: When did the institutional do anything but condemn dissent? What if we could actually question the modern church? Deacon: Aren’t you asking for a lot of trouble? Usher: From who? If one considers its own works, its reputation, its pride and its worth as nothing, then what’s the risk? Is trouble being disparaged or condemned by those who have little or no understanding actually a threat? I can hear the dialogue go kind of like this…..
Dissenter: But pastor, wasn’t the Lord’s supper to celebrate, to fellowship and to revel in Christ’s sacrifice for our freedom from sin? Pastor: Young man, on what authority do you speak? 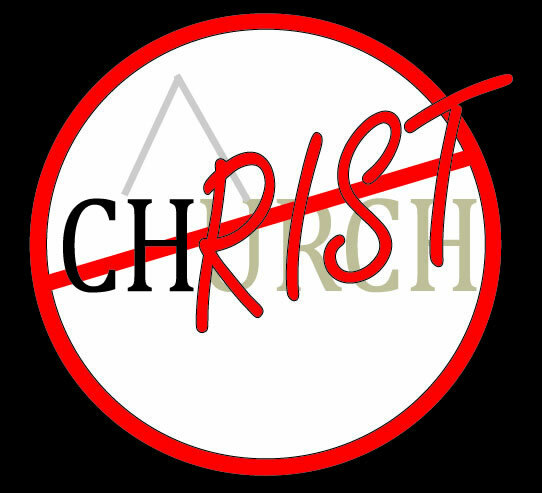 Dissenter: The same authority as you claim – Christ! Or is it on the authority granted to you by your Harvard degree? Pastor: Young man, do you not have reverence for the Lord’s house? Dissenter: Is this the Lord’s house? Or is it the church across the street, or the one across town – or one of the other 33,000 denominational “houses of worship”? I’m confused? Pastor: Young man you are disrupting the Lord’s supper! Dissenter: But Pastor, where is your proof that Christ truly asked for us to remember him by drinking a thimble full of Welch’s and a matsa crumb while sitting in defeat and condemnation for our shortcomings? Pastor: Son, I’m going to have to ask you to leave, your comments are inappropriate! Dissenter: Pastor, you haven’t answered my question – by what authority do you declare the Lord’s supper a time of regret, condemnation and pagan ritual? Deacon: Wow, God help the pastor who is faced with such a dissenter! This is response from a comment by Vanity of Vanities….great question by the way! Usher: Hey Deak, you got a response for Vanity of Vanities? Deacon: Once again Usher, the overall understanding of missionaries is that they are weak, needy, dependent and obliged to come back to their church with their hat in hand begging for support. Usher: Isn’t that what missionaries are to most churches? Deacon: To most churches – that is exactly what the churches have made the missionaries out to be. Because mission funds are just another program and the church simply does it because they’ve been told that that’s the right thing to do. Missionaries are almost never a priority especially with the pastor. If they were, the pastor would have to give up more of his money. But today’s church has made them such a minority in the areas of finance, that they are supported separate from the church tithe with special offerings. As you and I are not supporters of the 10% tithe, then one might ask, where would support dollars come from to support the missionaries? From the congregation of course! Usher: I get it. The congregation has no part in interacting with the missionaries, or getting their hands dirty. The pastor either hoards all the time with the missionary family or simply defaults to it because the congregation has no interest or simply doesn’t validate the role of the missionary other than coming back to the church to beg for money every so often! Wow, if the pastors only knew that by not making the congregation aware of the true roles of the missionary, they end up simply throwing all of the onus back onto him! And now he’s simply a jack-of-all-ministries and master-of-none! Deacon: If one were to rebuild this thinking, they would simply do away with the tithe, spend time getting to know the missionaries in their body, work towards contributing to the cause of the missionary, send the pastor out to tent-making school and the church would once again flourish. A church could actually further the kingdom by supporting missionaries who are out making disciples instead of lame marketing schemes carried out by the modern church that don’t have a chance other than to grow programs. Usher: Ain’t gonna happen! Man won’t change until God brings about disaster and takes away all the chocolates! We need another Egypt or fall of Rome or something to wake the church up. Till then, they’ll simply sit around and debate. Deacon: Kind of like what we’re doing? Usher: Hey, if one set of ears hears it and makes a true change in their way of thinking – we could have a revolution! And missionaries would be seen as warriors instead of pitiful little beggars as we have made them out to be. Usher: Hey Deak, it’s another case of deconstruction. Deacon: Yep, it’s a lot more widespread than people think. Fortunately, this one recognizes it’s a journey one must take to deprogram and challenge the falsehoods of their foundation. Usher: They mention bashing. Isn’t that the way of America? We seem to bash everyone based on our point of view differing with theirs. And then when we find our foundation is flawed, we have no friends. Deacon: Usher, you just described yourself. So what do you have to say for yourself? Usher: I guess Deak, the only friend I truly have is Him and him alone. My old friends don’t show up unless there is something to partake in (like fresh roadkill). They obviously don’t show up to see me unless I just come along with the package. Deacon: Now you’ve described the majority of all churches. They are institutions and not the refuge Christ described in the 1st century. They encourage you to show up so you can be indoctrinated and you can fund their ventures. Doesn’t mean they didn’t have good intentions to begin with, but for the most part, it’s just a framework going back to Constantine’s time. Usher: So if we bash those who do such, are we in the same boat as all the rest of the bashers? Deacon: Not if you bash them all. The church structure is fair game as I see it. The body of Christ, now that’s another story. Like tThose who call their words annointed, or continue to take money from the poor for their personal gain, should be in prison. Usher: So what kind of wisdom do you have for this person who now sees the craziness of things like Lakeland? Deacon: Embrace deconstruction and discover your first love. Christ will engage with everyone and anyone who seeks him out because he’s touched them. The desire to pursue Him is placed by Him. We often get diverted or distracted by the carnivals of man including Lakeland, prosperity doctrines, shepherd syndrome and the arguments of our 33,000 world denominations. Christ never intended it to be that hard. He touches us and invites us to have a “personal” relationship with him. Deconstruction is the rejuvenation of our faith. It’s here for a reason. He’s drawing his bride close. If you’re Creflo’s disciple, your tithe bought a Rolls Royce! Deacon: I read it. So how does a megachurch televangelist determine what is excessive? ATLANTA: An Atlanta megachurch took in $69 million (€47 million) in 2006, according to a financial statement the church’s minister released in response to a Senate investigation into him and five other well-known televangelists. The Rev. Creflo Dollar disclosed the World Changers Church International’s financial information to The Atlanta Journal-Constitution, but said the money he spends is his own. Dollar said his income comes from personal investments, including businesses and real estate ventures. But the church gave him a Rolls Royce, which he mainly uses for special occasions, he said. Excerpt: A frequent priority of the local congregation is to attract people to come to the physical property of the church so as to inlcude the “pagans” in the life of the church. This model began with the Roman Empire, especially after Constantine’s conversion and Christianity became the official Roman religion. ……In previous years, I invited people to church when I met them, thinking in that way they will hear the gospel. I began to see that I was giving the church an unfair advantage. I was asking them to come to my turf, where I was the leader, where I stand and speak while they sit and listen. It was a lack of courage that led me to rely on bringing them to a place where I was the boss and they were the servants. What I had to learn to do was speak the gospel on their terms — in their homes, in their boats — as a friend and as an equal. — Mark Peske, missionary to the Ojibwa. Usher: Question for you: How can a Constantinian church keep sending out “church planters” expecting them to be different? Aren’t they just building “mini-constantine’s”? How does one who wishes to truly be missional unlearn their constantinian ways and truly become a light in their community? And if you reply as we think you will, how does one support the church planter in such a way that they don’t revert back to the old power model and their old ways which they have been steeped in? The traditional church cannot and will not give up it’s powerbase and allow decentralization no matter what! Aren’t the two forces totally opposing? Is it not the “napster” effect to the music industry or the “skype” effect to long-distance telecommunications? Deacon: Our argument is that this is virtually impossible using today’s theology and students of Constantinian ways. Entire denominations are founded on this, how in the world can they attempt such an undertaking, though many have programs in place? Shouldn’t we be sending people into non-Constantinian environments for them to truly become missional? We westerners have a tendency to simply “term it”, “claim it” and “preach it” without any foundation other than someone else’s book, teachings or opinions. Summary: The Constantinian cannot play missional without dismembering itself, can it? We want to change the church, but to do this would mean to destroy livelihoods of pastors and church staff and fight about who is to receive the monies from the sale of the real estate (though this would be a great problem to have as it would mean the group had made the right decision). But really, the diaper-wearing christians will defend their institutional church and pastor and never give up their “binkys”, their custom-fitting “huggies”, their 1-hour-and-run services and their ability to write a check to free their guilt and not have to be bothered with getting their hands dirty or being weaned off their grace-laced formula. The Constantinian model MUST be supported by demanding tithe (substantiated by cut-and-paste scripture), it must grow in membership to support the programs the diaper-wearers demand of it. It must continue to build bigger buildings to keep up with the cost of programs, adding youth pastors and the cost of living for the staff. It must be a central top-down power model and in order to function, it must be headed up by those with college degrees from seminary. We are the ones who have demanded it (or gotten hooked on it and swallowed it and simply come back for more and more of the milk). Usher: Hey Deak, I wrote a rap, can you add the music? Oh where does the tithe of the poor people go? You fill in the blanks……. Usher; Hey Deak, I’ve been puttin’ some of our stuff on shirts. 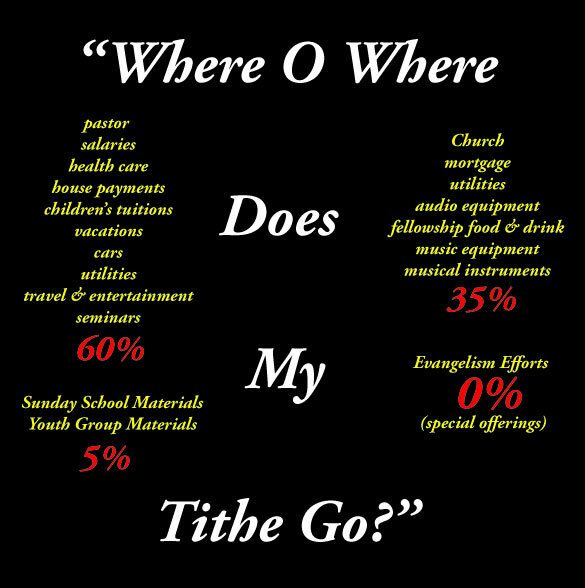 Where your tithe really goes! Deacon: You’re gonna take some heat from those Usher, but you know that. Usher: Hey Deak, hot is my middle name – hot roadkill, hot asphalt, so what’s new? Usher: Hey Deak, you ever listen to Reggie McNeal? Usher: Deak, what a novel approach – detox for pastors! Deacon: Yeah, but isn’t it just like traditional detox – doesn’t work until the church leaders admit they have a problem and seek help? Usher: That’s easy, when they refuse, we’ll just stage an “intervention” and extract the errant pastors from the “church that man built” and put ’em through detox! Deacon: Usher, what do you think people really look for when they’re choosing a new church? Usher: The real list or the lip-service list? Deacon: The real one, of course. 6. Distance from home – driving time? 9. Are the people friendly? 10: Age of people – are they “our generation”? What do churchgoers and gum have in common? Usher: Hey Deak, how come people care so much about what other people think? Usher: Don’t they know that nobody gives a damn? That everyone simply looks out for themselves – that selfishness cannot be avoided? Usher: Don’t they get GRACE? Usher: What are you talking about? Deacon: Usher, did you go to church last week – it was missionary Sunday? Deacon: Vacation Sunday, what are you talking about? Usher: It’s Pastor vacation Sunday. Isn’t that why missionaries visit? So the pastor can go out and play golf? Traditional Title of Pastor or Real Titles? Usher: Hey Deak, what if pastors were called by their real duties instead of some pastor of the church? 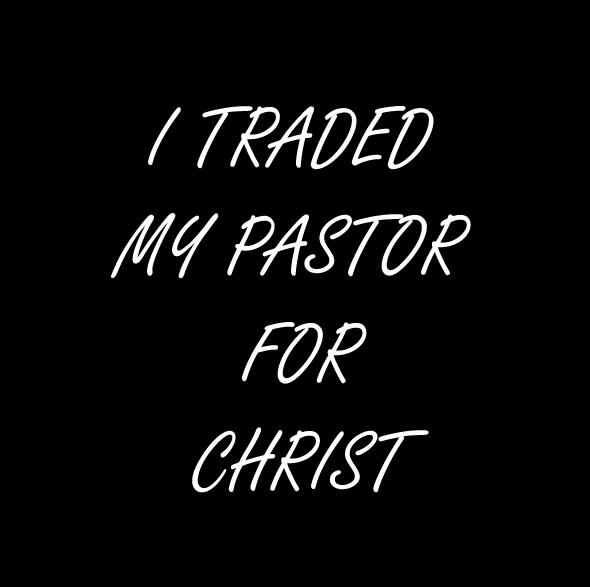 Who would your pastor be? Deacon: I don’t know, shepherd? Deacon: Usher, how does the church survive with church hoppers? Usher: Who says it needs to survive in the form it’s in today Deak? Deacon: Well it has been proven for about 2000 years. Usher: That’s up for debate, Deak. Usher: Let’s all be real. What is the motivation for a church to grow its membership? Money! It’s not furthering the kingdom. If it were, the church wouldn’t be telling its people to give, give, give and then only offer up an occasional prayer in exchange for all their investment. Deacon: But the church is for those who are saved, so they can grow and the church is their to disciple them. Usher: Deak, you’re more than idealistic on that statement. You call discipleship weak Sunday School (teachers who volunteer and are rarely taught, trained, held accountable, etc. ), cushy little youth groups with watered-down curriculum or some “made-up-curriculum” from the youth pastor who’s never done a single thing in his life except go to college, get a degree (with the greatest real life application being a few week-long mission trips to a safe haven)? Deacon: But that’s not a normal situation Usher. Usher: Life ain’t normal, Deak. Everyone who walks in the church is unique. Why does the church fall into the trap of offering programs that only cater to one group of people, then preach as though everyone in the group should buy into the shallowness of it all? People are all at different stages in their lives. One size fits all doesn’t cut it! Church is not about the Sunday morning service, it’s about the body life. Yet all the money the church collects and all the effort put into raising the membership is about the show or what I call the Sunday morning demonstration: “here are our great programs, don’t miss all the announcements about our great programs” and isn’t our worship team great? And I (the pastor) worked so hard this week to prepare this one-size-fits-all sermon “just for you”.